Enjoy the tour of one of the world’s greatest multiple wildlife-viewing venues, the Etosha National Park. In this three-day Etosha camping tour, the emphasis will mainly be on game viewing. Etosha is known to some as the 'great white place of dry water' and this is one of the places where herds of 50 elephants or more are often seen walking in the middle of the road or crossing it. Lions and hyenas require a bit of time to locate. Quite a few of the animals found in the park are rare and endangered, such as the black rhino and the black-faced impala. Altogether, there are 114 mammals’ species walking, prowling, and grazing while on constant alert for predators. You will stay in a camp at Etosha National Park on day one and two. Pickup from your hotel is between 08:00 and 08:30. You will have a long drive today. Later, you stop in Otjiwarongo to fill up with petrol and provisions. A picnic lunch will be served along the way, and in the afternoon, a camp will be set up at Okaukuejo. Okaukuejo is a popular choice due to its prominent well-established waterhole, which attracts a range of game in large numbers. You may explore the surroundings and enjoy the swimming pool before a late afternoon game drive. After dinner sits around the campfire, a visit to the floodlit waterhole is strongly recommended, as there are good chances of seeing nocturnal animals that hide during the day such as lions, hyenas, leopards, and rhinos. First things first as you spend most of the day game driving. A visit to a number of waterholes is your top priority including making a stop at the Etosha Pan, the “place of dry water”. The pan is an extensive flat depression of about 5,000 square kilometers. 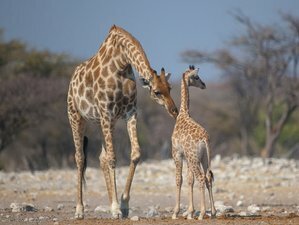 The fact that Etosha provides visitors with an opportunity to see large herds of game in its setting makes Etosha a unique experience in Africa. You may stop at Halali middle camp to have lunch before you continue your game drive to Namutoni. You will have time to relax at the swimming pool in Namutoni or at the waterhole before a late afternoon game drive. The game viewing is usually excellent with close views of springboks, zebras, impalas, giraffes, gemsboks, and plenty of birds. If you are lucky, you may also have some close encounters with elephants and lions. In the evening, you may enjoy a glass of wine and experience a fabulous sunset from the tower of the old German fort before dinner around the campfire. After a morning game drive, with the chance to get some more pictures of Etosha's wildlife in the soft morning light, you will depart from Etosha via the Von Lindequist Gate headed back to the city. You will travel on the main road (B1), making a short detour to Lake Otjikoto distinguished by its odd-green waters discovered in 1851. Otjikoto Lake is the smaller of only two permanent natural lakes in Namibia. It is a sinkhole lake that was created by a collapsing karst cave. Just before reaching Windhoek, you have time to stop in the small town of Okahandja which is also known as the “Garden Town”. The town has Namibia’s largest wood-carving market a chance to grab last minute souvenirs from Namibia. You are likely to arrive back into the city at around 16:30 and you will be dropped off at your accommodation on your return. The roads can be rough, bumpy and very dusty. At times the group will travel off-road and possible injuries may occur such as when hitting a rock or pothole. Even though every precaution is taken for this not to happen, Bluecrane cannot be held responsible for accidents or damages as Bluecrane operates adventure safaris. Due to the fact that Bluecrane operates mobile safaris, it’s imperative to control the weight and type of luggage transported. It is strongly recommended to use soft holdall (duffel) type bags. Luggage, excluding hand luggage (camera bag etc.) not to exceed 20 kilograms. Due to dusty conditions, it is suggested to keep camera equipment in a dustproof or plastic bag. This safari will cover several places in Namibia including Etosha National Park, Okaukuejo, and Namutoni. Namibia is a hot country, so drink lots of liquids. Most of the tap water in Namibia is purified and safe to drink. The guide will advise when to drink bottled water. All alcoholic drinks and any other special requirements on your own account at all times. Blue Crane Safaris offers safari with budget camping, private luxury accommodation, self-drive, and tailor-made tours throughout Namibia and Botswana. The prices below are posted in EUR. Please note that prices may fluctuate, depending on the current exchange rates.